The ability to communicate has always been at the heart of human endeavour, achievement and development. In the early 1800s, the main driving force behind the use of technology to improve the distance and speed over which people could communicate was the military. Communication networks had been constructed in several countries using a system called the mechanical, semaphore or optical telegraph. Here telegraph stations were constructed within line of sight of each other with each being equipped with a device that could represent a letter or word by the shape formed by moving arms or by a combination of shutter panels. A message was sent by setting a pattern on the first station which could be seen by the next in the chain. This station would then set its telegraph to the same pattern which would then be seen by the third station in the sequence and so on along the full length of the network. All such systems did of course, suffer in bad weather and at night when you could not see the next telegraph station in the chain. In good visibility though, these telegraph networks could send complex messages over great distances at very high speeds. However, a new form of technology was about to change the world and set in motion a global telecommunications revolution. The opening of the Stockton and Darlington Railway in 1825 and the Liverpool to Manchester Railway in 1830 meant that commerce, not military conquest, would define the future. These early fledging railways soon had to face a significant problem. How do you know where the trains are when the railway extends over many tens of miles and contains cuttings, tunnels and numerous curves. Using the mechanical telegraph systems perfected for military use was simply not practical. What was needed was a form of communication system that could work at any time of day or night, in any weather and without the need for line of sight communication. It was an important problem to solve for human safety; the efficient operation and indeed the whole future of the railways were at stake. On the 25th July 1837 two Englishmen, Charles Wheatstone and William Cooke demonstrated a system which they felt was the answer to the railway’s needs. Charles Wheatstone was born in 1802 in Barnwood, Gloucester. His father was a maker of musical instruments and in 1823 Charles and his brother took over his uncle’s music shop at 436 Strand. Throughout his early life Charles had developed a keen experimental bent and in 1834, at the very young age of 32, became Professor of experimental physics at King’s College, University of London. William Fothergill Cooke was born in 1806 in Ealing, Middlesex. His father was a surgeon and Professor of anatomy at the University of Durham. William became adept at producing wax models of anatomical dissections and whilst travelling in Switzerland in 1836 witnessed an electro-telegraphic experiment by Professor Muncke of Heidelberg who was demonstrating a Schilling apparatus. Cooke saw the business potential that such a system offered to solve problems being encountered in the new Railways but despite several attempts failed to turn his vision into a practical reality. In February 1837 he was introduced to Charles Wheatstone in London who, he discovered, had similarly been working on the development of an electrical telegraph. So started a partnership that was always tense but that would produce the world’s first practical, working, electrical communication telegraph. Wheatstone and Cooke exploited the relatively new discovery of electro-magnetism by Michael Faraday. Faraday had demonstrated that an electrical current flowing through a coil of wire generates a magnetic field. Similarly a magnet moving within a coil of wire generates electricity. Wheatstone and Cooke used these ideas to devise a system whereby electricity sent down a wire passes through a coil at the far end. The magnetic field generated in the coil then moves a magnetised compass needle. If the flow of electricity is reversed then so too the magnetic field in the coil is reversed and hence, the compass needle is deflected in the opposite direction. In this way, the direction of electric current flow can be made to move a needle to the left or right. Using this basic principle, Wheatstone and Cooke constructed an instrument that comprised 5 needles arranged on a grid of letters. Moving two needles at the same time points to a letter on the grid. Here moving second needle to the right and the and the fourth needle to the left points to the letter ‘F’. This is known as a direct reading telegraph in the sense that the output shows the letter being sent. In contrast, later telegraph systems would use codes to represent letters and unless you knew the code, then you could not determine what letter was being sent. On 25th July 1837 with Cooke at Camden Town and Wheatstone at Euston, two stations on the London and Birmingham Railway about nineteen miles apart, messages were exchanged using their five needle telegraph. This event clearly demonstrated that information could be sent over long distance using electricity. There were problems with the five needle telegraph. Firstly, on close inspection it can be seen that only twenty letters can be represented; C, J, Q, U, X and Z couldn’t be sent. Secondly, moving five needles requires six electrical conductors and in 1837 that would be both practically difficult and expensive. 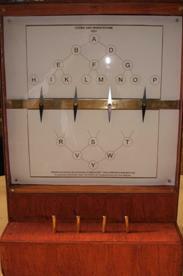 A small improvement was made with the four needle telegraph. Reducing the needles from five to four reduces the number of conductors required but still can only provide for twenty letters to be sent. The reduction of one needle changed the operation of the telegraph in that some letters were sent by moving only one needle. For example H and I, K and L, M and N and O and P were all indicated by the movement of just one needle either left or right. Shown here is a working model of a four needle telegraph that we have constructed to demonstrate the basic operation of such equipment. You can see this telegraph in action at our various public lectures or at a Family Telecommunications Day (see remainder of the website for details). Wheatstone and Cooke continued to develop their electrical telegraph producing new models that used less and less needles. Whilst each of these developments reduced the number of wires required, they moved away from the concept of a direct reading instrument. The two needle of 1840 and single needle telegraph of 1845 all used a code (the number of times a needle moves left or right) to indicate the letter been sent. So a reduction in the complexity and cost of the wiring resulted in an increase in complexity of using the equipment. On the 6th August 1844 the birth of Queen Victoria’s second son, Alfred Earnest, at Windsor Castle was transmitted to the offices of the Times newspaper within 40 minutes. They reported the story as being “in debt to the extraordinary power of the electromagnetic telegraph”. However, the growth of the electric telegraph into the world’s first global telecommunications network has to be attributed to the work of Samuel Morse, Alfred Vail and Leonard Gale. They together devised an electrical telegraph system that used just two conductors (or one and a common ground return) and transmitted letters and numbers using a code comprising a sequence of short or long electrical pulses. These short and long pulses soon took on their more familiar names as ‘dots’ and ‘dashes’. Whilst they had been working on their electrical telegraph since 1835, it was not until 1840 that they patented what is now known as the Morse Code. In December 1842 Morse demonstrated his telegraph working between two rooms in the Washington Capitol Building and on 3rd March 1843, Congress passed the Telegraph Bill by 89 to 83 votes and allocated $30,000 dollars for a telegraph line from Washington to Baltimore along the Baltimore and Ohio Railroad. The first message sent was “What God hath wrought” and was transmitted on 27th May 1844. Examples of Morse Code Telegraph equipment manufactured by J H Bunnell & Company, New York. A telecommunications revolution had begun. Within the UK there were 1300 telegraph stations communicating over 10,000 miles of telegraph line in 1868 but only four years later this had grown to 5,179 stations and over 87,000 miles of line. The electric telegraph was set to become ‘The Victorian Internet’. And just like today’s internet, the telegraph impacted all aspects of life. On 1st January 1845 a man who was suspected of the murder of Sarah Hart had boarded a train at Slough station destined for Paddington. Police used a Wheatstone-Cooke two needle telegraph to signal ahead. Since this telegraph could still not send the letter ‘Q’ the message famously contained a description of the man as being “in the garb of a Kwaker”. Despite the slight confusion, John Tawell was apprehended at Paddington, found guilty and thereafter became known as the “man who was hanged by the electric telegraph”. Communications networks continued to expand. A telegraph line was laid under the English Channel in 1850 and the first trans-Atlantic telegraph cable was installed in 1858. Despite its short life, just one month, the trans-Atlantic cable had demonstrated the power of electrical communications and a permanent connection was finally established between the ‘old’ and ‘new’ worlds in 1866. In 1868 the Disraeli government introduced the Telegraph Bill to “enable the Postmaster General to acquire, maintain and work the Electric Telegraph in the United Kingdom”. This remained the case until the Telecommunications Act of 1981. In 1871 the Society of Telegraph Engineers was formed in the UK. This Society evolved into the Institution of Electrical Engineers (1889) and then the Institution of Engineering and Technology (2006). The electrical telegraph had demonstrated to the world the importance and potential of using electricity to send information around the globe. The world would be forever changed and the electric telegraph was simply the first in a long line of engineering achievements and developments that have today given us the world-wide-web, broadband and the mobile phone. Here are just a few of the key developments that followed Wheatstone, Cooke and Morse.